MISSION, KS--(Marketwired - Oct 17, 2013) - (Family Features) This Halloween, throw a wickedly wonderful fete for family and friends. With help from the Wilton entertaining experts, you'll have all the tricks to treat your guests to a spooky celebration that will leave them howling with delight. Halloween's not just for the kids anymore, so before you put on your costume, grab your baking and decorating supplies and get ready to let the creepy crawlers loose. "Halloween is the one time of the year that you can take your decorating skills to the dark side," said Nancy Siler, vice president of consumer affairs at Wilton. "From finishing pumpkin cookies with ghastly grins to creating creepy cakes decorated like graveyard skulls, it's the perfect holiday to have some fun in the kitchen." Creepy Cupcakes: Transform traditional cupcakes into other worldly creations by decorating with eyeballs, spider webs or candy corn. Set up a decorating table during your Halloween party and let kids make their own creepy creations. Trick the Treat: Swap out the standard packaged treats for homemade sweets. Wrap cookies, pumpkin cake pops and lollipops in decorative party bags for a fearfully fun take-home treat. Mummy Wrap: Dress up your Halloween treats with themed baking cups. Pumpkins, mummies and ghosts are an instant way to give your party extra personality. Stack the Skulls: Turn the crouque-en-bouche, a popular French dessert, on its head by replacing cream puffs with mini-skeleton skulls. To increase the scare factor, mix in bone-shaped cookies and antique the treats with Candy Melts candy and Color Mist food color spray. Try these recipes for Pumpkin Cake Pops and Graveyard Crouque-en-Bouche for a spook-tacular Halloween party. For more unique decorating ideas and recipes visit www.wilton.com. Preheat oven to 325ºF. Prepare Dimensions Mini Skull Pan with vegetable pan spray. In large bowl, combine flour, sugar, cinnamon, baking powder, baking soda, salt, cloves and nutmeg. In small bowl, whisk together oil, eggs and applesauce. Add to dry ingredients, stirring until well combined. Fill each cavity about 2/3 full with 1/3 cup batter. Reserve remaining batter. Bake 30 to 35 minutes or until toothpick inserted in center comes out clean. Cool in pan 15 minutes. Remove to cooling grid and cool completely. Bake remaining batter as above. To assemble, cut the domes off of fronts and backs of skulls and sandwich with buttercream icing. Preheat oven to 350°F. Lightly spray Bones Cookie Pan cavities with vegetable pan spray. In large bowl, beat butter and sugar with electric mixer at medium speed until well blended. Beat in egg and extracts; mix well. Combine flour and salt; add to butter mixture. Beat until well blended. Press dough into prepared pan cavities, filling 2/3 full. Bake 9 to 10 minutes or until light brown around edges. Cool in pan 10 minutes. Turn pan over; lightly tap pan to remove cookies. Cool completely on cooling grid. Place assembled cakes and cookies on cooling grid positioned over cookie sheet. If desired, add yellow candy color to melted white candy; pour over cakes and cookies until well coated. Chill 10 to 15 minutes or until set. Repeat if needed. Using disposable decorating bag, pipe melted black candy face details on skull cakes; chill 5 to 10 minutes or until set. 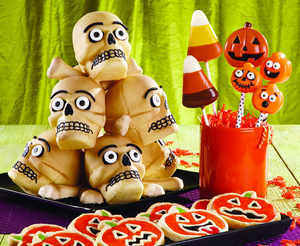 Attach candy eyeballs to skulls with dots of melted candy. If desired, brush Color Dust highlights on candy-covered bones and skulls. Using melted white candy, secure four decorated skull cakes to cake base or serving platter, hold until set; insert decorated bone cookies between cakes. Add second row of skulls, positioning between the skulls below and securing with melted candy; hold until set. Add bone cookies between skulls. Secure final skull to top of tower with melted candy; hold until set. Arrange remaining bone cookies around base of cake tower. Preheat oven to 350°F. Lightly spray Easy Decorate Pumpkin Cookie Pan with vegetable pan spray. In large bowl, beat butter and sugar with electric mixer at medium speed until well blended. Beat in egg and extracts; mix well. Combine flour and salt; add to butter mixture. Beat until well blended. Press dough into cavities, filling 2/3 full. Bake 10 to 12 minutes or until light brown around edges. Cool in pan 10 minutes. Turn pan over; lightly tap pan to remove cookies. Cool completely on cooling grid. Decorate cooled cookies with Sparkle Gel, using light green for stem; black for eyes, mouths and mustaches; red for tongue; and orange for remaining pumpkin areas. Let set, about 1/2 hour. Melt Candy Melts candy as needed following package instructions. Pipe or brush details of Candy Corn/Pumpkin Lollipop Mold with melted candy; chill in refrigerator 5 to 10 minutes or until set. Fill candy mold cavities with contrasting melted candy. Place lollipop stick into mold, rotating the stick so it is completely covered with melted candy. Chill in refrigerator 10 to 15 minutes or until set. Remove from candy mold. NOTE: For simpler preparation, lollipops can be molded using a single candy variety. Preheat oven to 350°F. Prepare 12-cavity Silicone Petite Pumpkin Mold with vegetable pan spray. Prepare cake mix following package instructions; fill silicone mold cavities 2/3 full with cake batter. Bake 8 to 12 minutes or until toothpick inserted in center comes out clean. Remove from mold and cool completely. Melt orange Candy Melts candy following package instructions. Dip lollipop sticks in melted candy; insert into bottom of cakes. Using spatula or butter knife, spread melted candy onto backs of cakes; chill in refrigerator 5 to 10 minutes or until set. Place cooled cakes on cooling grid positioned over cookie sheet, candy side down; spoon or pipe melted candy over cakes until well coated. Chill in refrigerator 10 to 15 minutes or until set. Repeat if desired. Melt black Candy Melts candy in disposable decorating bag; cut small hole in tip of bag and pipe mouth, nose and eyebrows on pumpkins. If desired, pipe melted white candy teeth. Attach candy eyeballs with dots of melted candy.